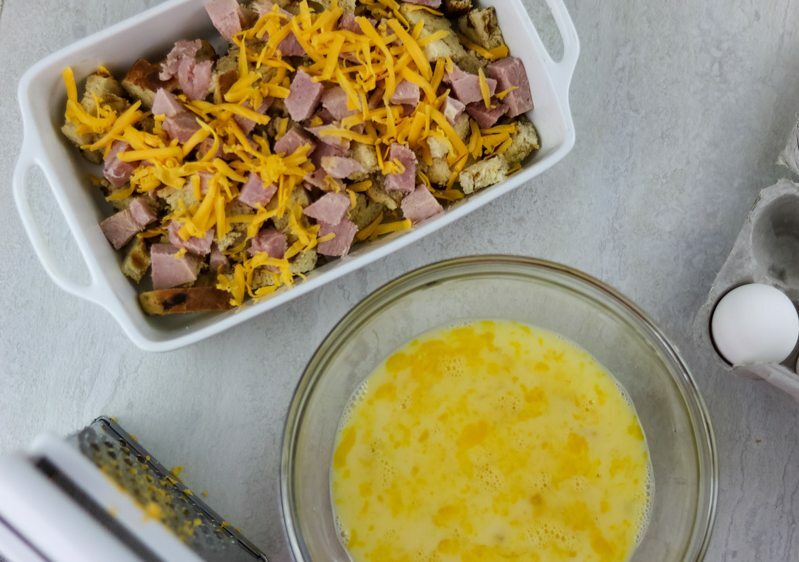 Overnight Ham and Egg Breakfast Casserole: A make-ahead sweet and savory combination of honey glazed ham, sharp cheddar cheese, and sweet bread baked in an egg custard. Perfect for Entertaining. There is something about sweet and savory combinations at breakfast. That has to be why Brunch is so popular–you can have a little bit of a savory, a little bit of sweet and be incredibly satisfied. 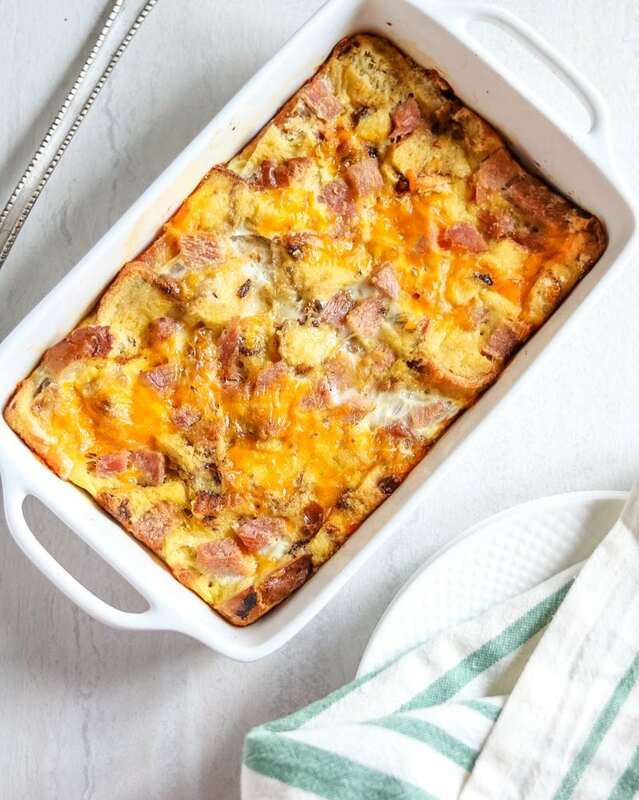 That is why a breakfast casserole with ham and sweet bread is a perfect way to enjoy the best of both worlds. 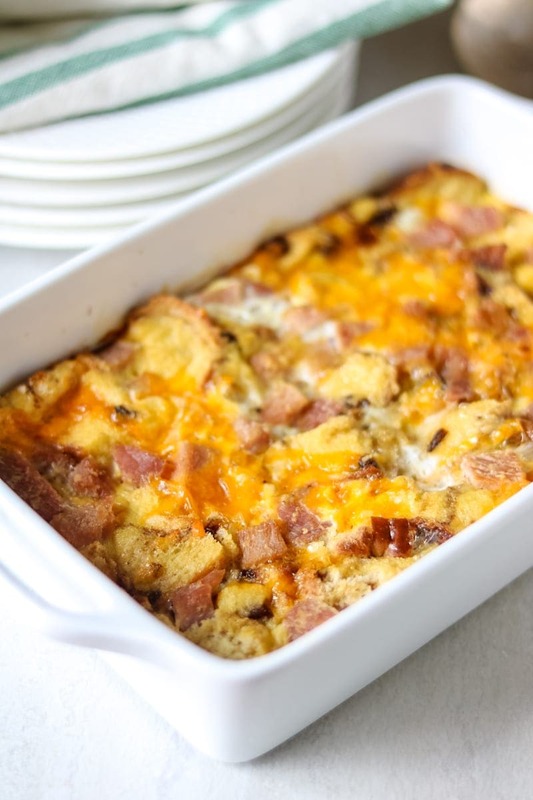 This breakfast casserole has it all! Sweet cranberry walnut bread, savory ham, sharp cheddar and a rich egg base are baked up into an EASY breakfast casserole. Since this is an overnight ham and egg casserole, it is absolutely PERFECT for entertaining. Prep the night before, and your only job will be to brew the coffee while your casserole bakes. Grease a large casserole dish (9 by 13 or 2 quart) with butter. Layer the bread, ham and cheese inside the prepared dish. Whisk together the eggs, cottage cheese, dijon, maple syrup and seasonings. Pour the egg custard over the mixture. In the morning, bake and serve. Do you have to make this Overnight Breakfast Casserole the night before? No, by making it the night before, the bread has a chance to soak up the custard, but you can bake it immediately. If you bake right away, just be sure to press down the bread into the custard to “help” it absorb the egg mixture. If you need this be a gluten-free breakfast casserole, use your favorite Gluten-Free Bread and be sure your ham is gluten-free as well. If you want to have cranberries or raisins in this breakfast casserole without raisin or cranberry bread, sprinkle raisins or cranberries over the ham and bread and add 1/2 teaspoon cinnamon to the egg custard. You can use whole wheat bread, french bread, or brioche bread as well. Cooked maple sausage would be great in this casserole in place of ham if desired. You may be tempted to serve this casserole with a side of maple syrup. I say go for it–adding an additional touch of sweetness to a dominantly savory and salty dish, completely takes this over the top–and you want to be over the top when it comes to wowing people with food. A make-ahead sweet and savory combination of honey glazed ham, sharp cheddar cheese, and sweet bread, and an egg custard. Perfect for Entertaining. Butter a 2 quart or 9x13 casserole dish. Spread bread over casserole dish, and top with ham and cheese. Mix together eggs, milk, cottage cheese, maple syrup, mustard, nutmeg, and salt. Pour over bread and ham. Uncover casserole and bake for 40-45 minutes. Allow to sit for 10 minutes before serving. Do you have to make this Overnight Breakfast Casserole the night before? No, by making it the night before, the bread has a chance to soak up the custard, but you can bake it immediately. If you bake right away, just be sure to press down the bread into the custard to "help" it absorb the egg mixture. What a fabulous recipe. My kids and son-in-laws still make fun of the fact that two Christmases ago, I promised them breakfast if they’d show up bright and early for Christmas morning fun. I didn’t end up having time and they won’t let me forget it. Casserole would be the way to go maybe. Thanks for sharing! 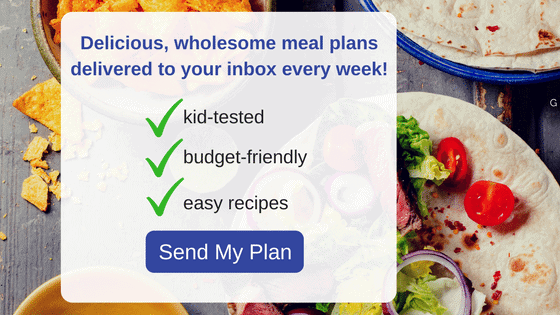 Diane, no more excuses–this casserole is too easy not to have breakfast ready! This looks yummy and pretty simple to make! I will definitely continue to refer to your blog for meal ideas. Ham and cheese are just meant to be together. This is a great option for breakfast. Ham and Cheese are a perfect combo! Ham and cheese is always a match made in heaven. This looks perfect for the holiday season when I am in need of quick breakfast ideas that can be made in bulk! What a clever idea to use a sweet bread in a savory dish! This looks just wonderful! Thanks Annie, the sweet and savory give this dish so much flavor!! I love that you put cranberry walnut bread in this Kristen! So unique and I know this breakfast casserole tastes amazing!!!! And yes, I would totally love a drizzle of maple syrup on this. I love overnight breakfast options like this! Perfect for the busy holiday season! Thanks Jessica–does make the mornings easier for sure! Breakfast is the hardest meal for me to try and get anything other than boxed cereal into my kids. They’d love this! At the same time, if I actually managed to get it to them they’d be like “Who are you and what have you done with our mom?” Thanks for linking up to #SaucySaturdays. 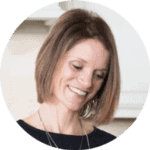 Christine–you CAN Do this–just a few simple steps! Oh man, I need this in my life 😀 Looks super yummy! I hope you LOVE it Sarah! YAY!!! That makes me so happy Lori! I love the sweet and salty combination myself! I love overnight casseroles because they make weekdays so easy, this one was so delicious! I am so glad your family enjoyed Rebecca! This is perfect! Im always looking for fun easy recipes to make my morning run smoother. YAY!! This makes the mornings so easy! 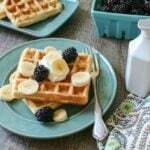 What a tasty and easy breakfast to make for a crowd! Looks very tasty! Do you bake it covered? Hi Nancy, this is a casserole you bake uncovered. I will be sure to clarify in directions Nancy! Enjoy! Can this be made 24-48 hrs ahead of time or just 12? Hi Angel! I would make this casserole up to 24 hours in advance. At 48 hours, the bread may disintegrate. Hope you enjoy!